Members of the Northfield Historical Commission have sometimes felt like bystanders on the sidelines of history as archaeological sites with potential significance get dug up without accountability. It’s an age-old problem. One has only to visit any local museum and browse the collection of arrowheads, pottery shards and other artifacts, often stripped of their connection to a specific site, to realize that important history may have been lost. Objects with a provenance offer clues to settlements and migration patterns that add value and interest beyond their inherent appeal as an ancient object. According to the Massachusetts Historical Commission, Franklin County “is home to a large number of Native American, Dutch and English sites dating from 13,000 years ago through the Contact Period of the 1600s and continuing on through the Colonial Period into the present.” That’s why the state historical commission has developed an Archaeological Accountability Policy for adoption by towns hoping to protect their archaeological resources. In Franklin County, Deerfield and Gill historical commissions have adopted the MHC Archaeological Accountability Policy. 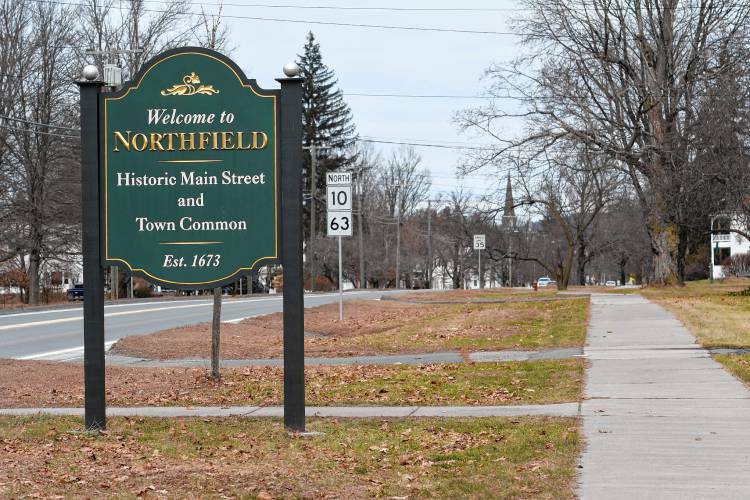 Now, the Northfield Historical Commission would like to get its own version passed as a town bylaw. Mid-December, 2018. Forty seven degrees, sun is shining. Kejegigihlasisak w’m8jalinton – chickadees singing. Remembering again for the first time. N’mikwalm8nowak – we remember them. Last month, on October 23, 2018, I attended a Moody Center event held on the grounds of the former Northfield Seminary for Young Ladies, a school founded in 1879 by famed Christian evangelist D.L. Moody, who was born (1837) and raised in the village of Northfield, Massachusetts. The Northfield Seminary was founded specifically to serve girls from poor families who had limited access to education. In time, the school developed a reputation as an excellent academic institution, and it began accepting students from all socioeconomic classes. Two years later (1881), the Mount Hermon School for Boys was established on the other side of the Connecticut River in Gill, MA, the current site of the consolidated Northfield-Mount Hermon (NMH). The majority of the buildings and some acreage now belong to Thomas Aquinas College, a Roman Catholic, California-based liberal arts college that plans to open an East Coast campus there in 2019. Plans call for it to eventually serve 350 to 400 students. Some additional acreage and 10 other buildings are now owned by the aforementioned Moody Center, a nonprofit organization honoring the legacy of NMH founder D.L. Moody. The event was styled the official public launch of the Moody Center and an announcement of its plans for the future at the campus. 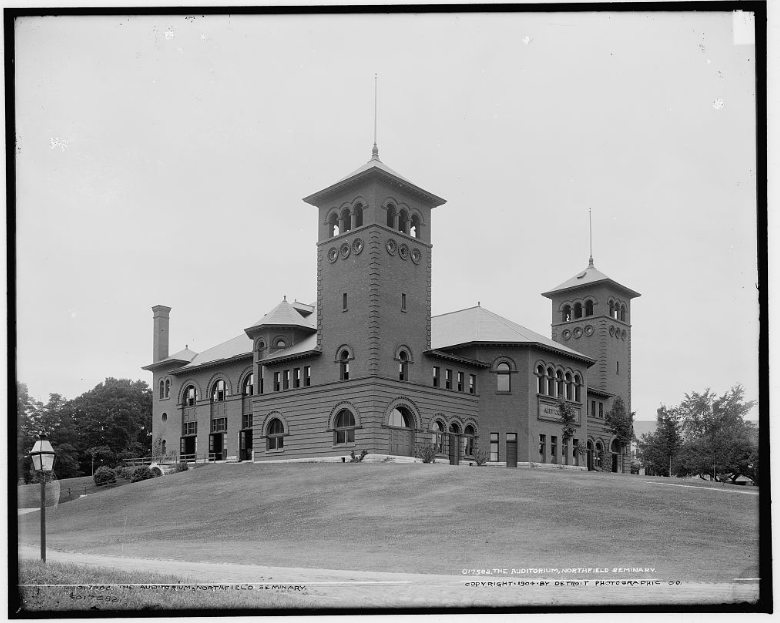 It was held in the Auditorium, built in 1894 with a capacity of 2500 people, and situated on a height of land at the easterly edge of the grounds. Thousands of classes, conferences, concerts, and church services have been held inside this imposing edifice in its 125 years. Conducted as a joint public announcement and evangelical Christian service, the October 23rd event was to include a rededication of the gravesite of Dwight Moody (died 1899) and his wife, Emma Revell Moody (died 1903), situated on a small knoll known as Round Top, immediately to the south of the Auditorium. Round Top, often referred to as “the most hallowed place in Northfield,” figured largely in the life story of Moody and the many others that have gathered at the school over the years to join in the various religious and educational activities there. A search online makes its significance in this regard abundantly clear. A contemporary view of the Dwight and Emma Moody gravesite at Round Top, ali nkihl8t, looking westward (Western Abenaki). Back to the event: the program was structured in two parts, the first a worship service, some history to preface the announcement of the launch, an explanation of future plans, a recognition award, and then an intermission. The second part was to include additional worship, a keynote address, and then dismissal to nearby Round Top for the rededication ceremony. I sat in one of the many seats in an audience of scores of supporters and the curious public, for the first hour and a half, and then stepped outside at the break. Thinking I had probably absorbed enough and would head back north toward home, I walked over to the gravesite knoll, where a photographer was setting up for the imminent rededication. I had in mind (even before I came there that day) the aphorism that disparate cultures may find the same geographical sites notable, and even sacred, and that Round Top may have been a significant location to the indigenous Sokoki, for any number of reasons within their own cultural values. There is often a pattern of displacement and replacement – intentional appropriation, both symbolic and physically – overlaid on these places, a site-specific instance of the land dispossession that defines colonization. For more, see Jean O’Brien’s excellent analysis of the wholesale application of this practice in Firsting and Lasting: Writing Indians Out of Existence in New England. Round Top postcard, circa 1902, Detroit Publishing Co.
A light precipitation had begun to fall from the darkening sky and the breeze was picking up, as I approached the small prominence. The twin gray granite gravestones stood on the rise, surrounded by an iron chain with ornate posts, and sheltered by a small grove of tall white pines and stately white birches. I took in the open prospect before my eyes, looking up and down the valley of the Kwenitekw/Connecticut River, the wolhanak/intervale meadows, and the hills rolling off into the west, toward the Pocumtuk, Mount Greylock, and the Green Mountains on the horizon, where the sun would end its traverse shortly. 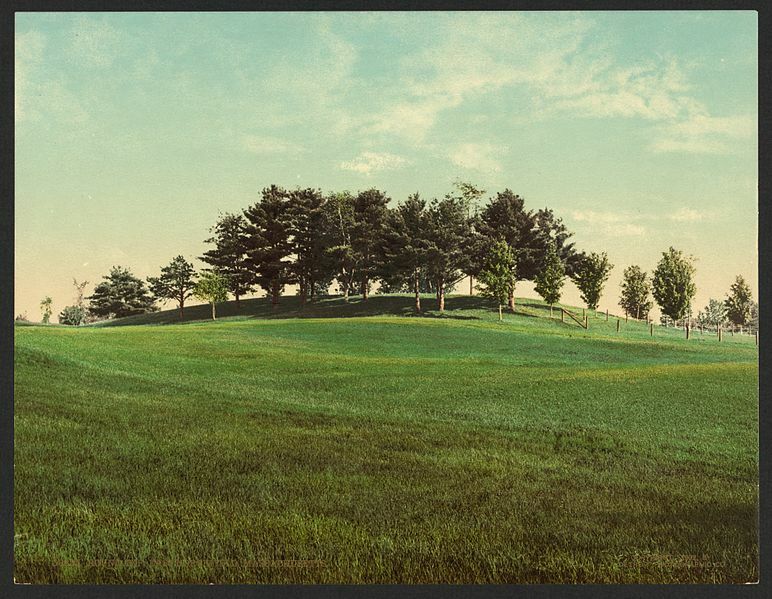 The gentle mound of earth, at the height of land rising from the terraces, did indeed seem like a natural gathering place. In sight were Pachaug Meadow to the northwest, Great Meadow below, Natanis southwest at Bennett Meadow, and Moose Plain, across the River. The Great River Road following the east bank at the bottom of the immediate slope has now become Massachusetts Route 63. Thinking back to what this place may have looked like several hundred years ago, before Puritan captive Mary Rowlandson made her slow way northward past this very spot in 1676, I could picture fertile planting fields, grasslands regularly cleared with controlled burns, and wigwams on the higher ground around me. The scattered raindrops began to get larger and more frequent. I laid tobacco at the base of a twin birch, said good-bye to the photographer, wishing him well with the weather, and walked back to my car. Since then, I hadn’t thought much more of it. But this week, I received by email a Moody Center newsletter, authored by Board Member Dr. Edwin Lutzer describing his participation as the keynote speaker during the October program. The newsletter is entitled “Standing Where D.L. Moody Stood – and Reviving His Legacy.” Several excerpts stood out as unexpected anomalies within an otherwise didactic and altogether familiar narrative (familiar because I grew up immersed in evangelical, fundamentalist Protestant Christianity, replete with plentiful references to D.L. Moody). After my message, the plan was for me to lead our 200+ guests to a nearby hill on the property known as “Round Top,” which is where D.L. 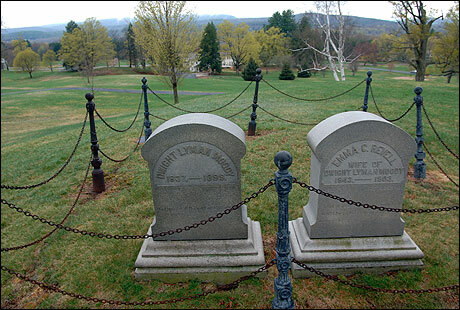 Moody and his wife, Emma, are buried. In Moody’s day, this was referred to as the “Olivet” of the region, because Moody himself liked to gather students in the nearby valley and teach them the Scriptures. He even said he would like to be buried at the picturesque Round Top. Thankfully, his wishes were honored. In the many decades since D.L. Moody’s death, students have continued to gather at Round Top for times of visiting and religious services. Word also has it that witches came to the property, representing their religion. Another board member shared that, as he walked up the hill many years ago, he saw what appeared to be a witch at Moody’s grave. She was dressed in all black and was chanting until she saw someone approaching and began to run. This is why a brief ceremony was planned for Round Top as part of the launch event, thus renouncing the past and rededicating the property to Jesus Christ and the furtherance of the Gospel. As the service concluded and music filled the auditorium, guests began to leave and were immediately greeted with a double rainbow. Not only was the sun shining — but there was not a cloud in the sky! Some interpreted this as a sign of God’s blessing. He speaks through the thunder (see II Samuel 22:14; Psalm 77:17); but after the thunder comes the blessing of sunshine. 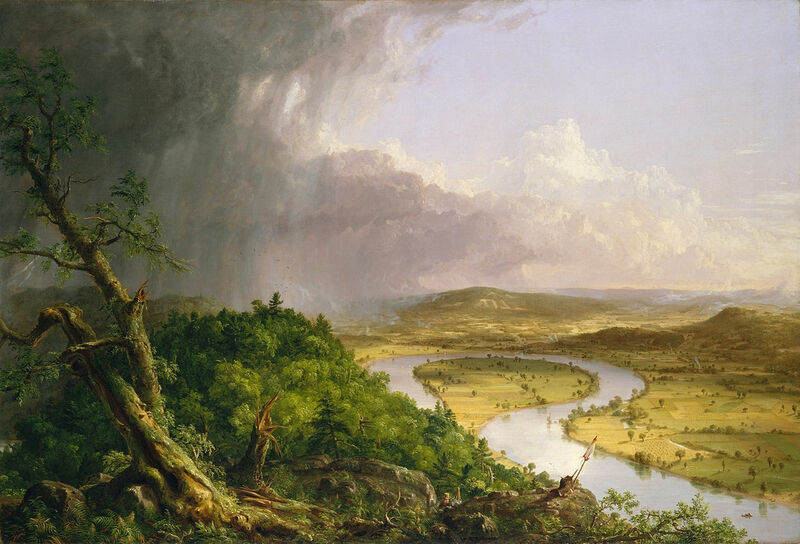 A thunderstorm sweeps over the Valley: Thomas Cole, The Oxbow (The Connecticut River near Northampton 1836). The ability of medeoulin or mdawinno (an Abenaki medicine person) – or pauwau, further south in Algonquian New England – to understand and work with the atmospheric spirit forces, among many others, was and is well-known. The powers of the Bad8giak, or the Thunders, who come from the west, are – in Abenaki cosmology – a natural positive counterbalance to other spirit powers considered more destructive or debilitating. They may be represented in the shape of a thunderbird and invoked to keep other energies at bay. Native medicine people were typically equated with witchcraft or sorcery by the early colonists; it is worth noting is that this characterization of association with evil persists in modern Christianity. Note: this is an anecdotal observation of a place-based intersection of spiritualities in Squakheag/Northfield, a center of Sokwakiak culture. Food for thought. Members of the Abenaki nation will bring people into the history and culture of local indigenous groups on Saturday, July 21, at the Northfield Mountain Recreation and Environmental Center. This “day of history,” from noon to 3 p.m., is the second in the Northfield Historical Commission’s series on “bringing to light the native history of our area” that encompasses a period of at least 12,000 years, Commissioner Lisa McLoughlin said. Roger Longtoe, Chief of the Elnu band of the Abenaki nation, will talk about local history from the 17th century up to modern times, using period-authentic “things that we would have had in the 17th century,” like muskets, spears and bows and arrows, he said. 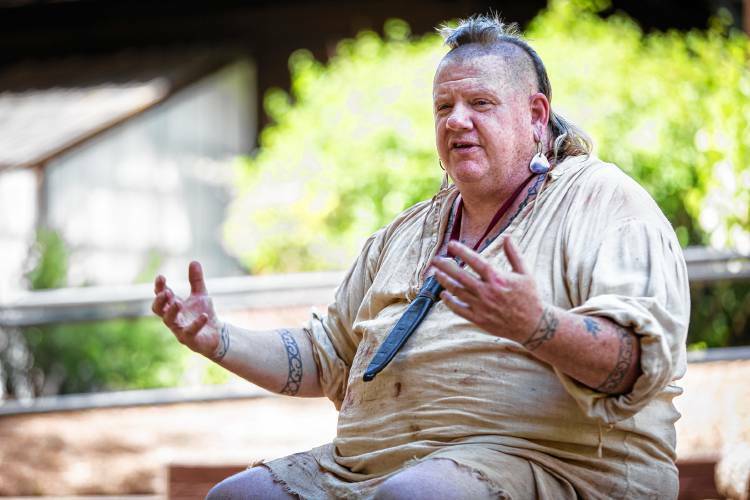 Longtoe specializes in what he calls “living archaeology” of the 17th and 18th centuries, using materials and traditional stories to help people understand the way Abenaki peoples lived when they occupied vast regions in Massachusetts, Vermont, New Hampshire and eastern New York. But, “a lot of people have questions about modern history, too,” he said. Now, the Abenaki nation has about 15,000 members and is mostly based in Vermont, with reservations in Quebec. The Elnu band has about 60 members and is based in southern Vermont, making it the southernmost group of the larger nation. 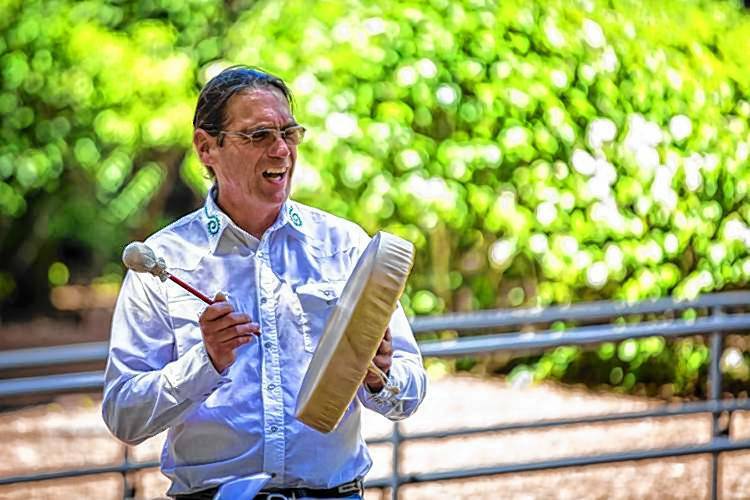 Rich Holschuh, representative of the Elnu band, will lead a walk through Northfield Mountain’s trails where he will try to communicate the traditional understanding of the environment. Singer-songwriter and guitarist Bryan Blanchette will play traditional and new songs in both Abenaki and English. Also, an update on a National Park Service-funded study of King Philip’s War will be discussed by David Brule, president of the Nolumbeka Project. The Nolumbeka Project advocates for a more thorough understanding of indigenous history up to and including the colonial era. The study, now in its third phase of funding, is focusing on the Battle Turners Falls. See the original article by Max Marcus in the Greenfield Recorder. 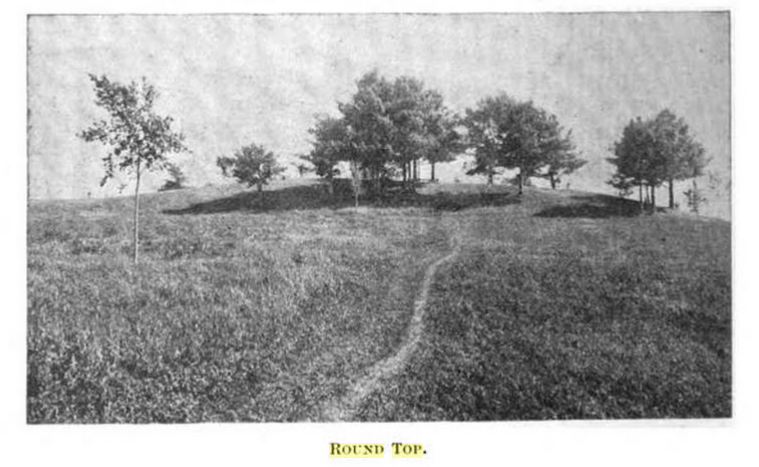 The intervales and meadows at Fort Dummer, upon West River, and at the Asylum farm, were found entirely bare of forest trees. Such was the fact with all the meadows on the Connecticut River at the time of the first settlement of New England. The Indians burned them over every year, and used them for planting grounds. A good overview of the Eastern Algonquian practice in general can be found here, in a USDA publication entitled “Wildland Burning by American Indians in Virginia” by Hutch Brown (2000). Grounding this locally, we can now take a look at Walter Needham’s “A Book of Country Things” (1965). Walter was a lifelong Guilford, VT resident, who wrote (with co-author Barrows Mussey) a rather popular little book recounting the things he learned from his grandfather Leroy L. Bond, born in 1833. Among them was a familiarity with locating the signs of indigenous presence in the local landscape, a skill that Walter modestly claimed was the only thing at which he had become more adept than “Gramp”. In fact, he is known as one of the more active “relic hunters” in the immediate area (present-day Dummerston south to Vernon, Vermont); regrettably, his collections, for the most part, seem to have disappeared leaving only loose, vague accounts. The memories that remain, however, bear out a story of widespread, active settlement and extensive usage of the Kwenitekw and its landscape, counter to the prevailing Euro-American narrative that held (and often still holds) otherwise. 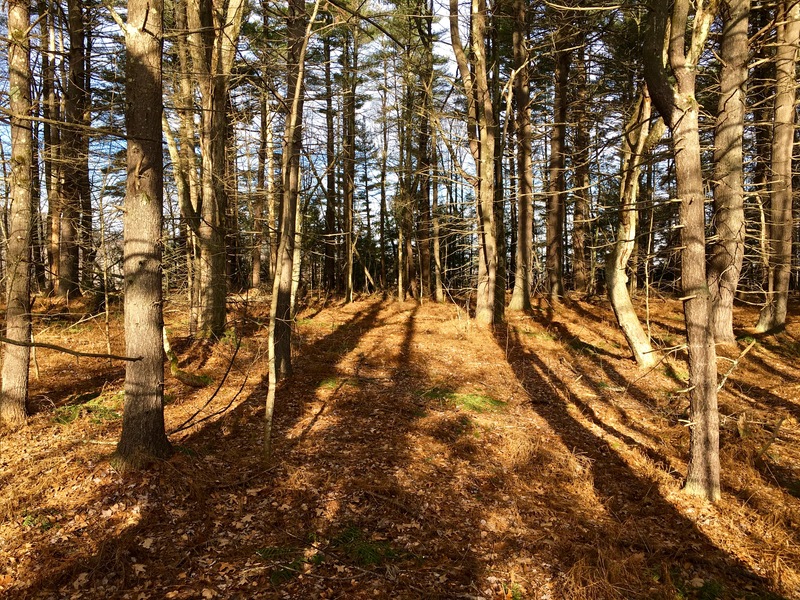 Speaking of the land management practices of the area’s original inhabitants, Needham relates: “Instead of plowing the cornfields like we do, the Indians burned them over every year. In most of the flat places where I find Indian relics, there’s a black line at one level of the soil, and under a [magnifying] glass you see it’s tiny pieces of charcoal.” Needham refers several times to this thin black line in the riverside stratigraphy. 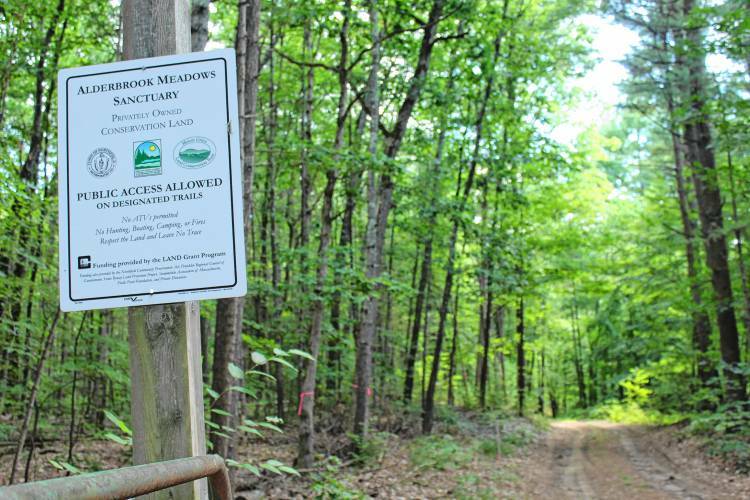 “Since the project began, Rasku said Mount Grace has coordinated with the Abenaki, Nipmuc, Narragansett and Wampanoag tribes due to the land’s cultural significance. “It’s had a lot of features tribal nations would appreciate,” he said, explaining the tribes could gather medicinal plants, harvest the nearby farm fields and take advantage of the water source, making the area around the pond active. Read the full article by Shelby Ashline in the Greenfield Recorder here. Interpretive signage on the Ames Trail will include information about Abenaki cultural lifeways and language translations for our many indigenous relations. Aln8baodwaw8gan! The Abenaki are here. They exist. And yet, they still live in a reality where not everyone is aware of that. But that is changing, slowly, but it is changing, said Joe Graveline, a member of the Northfield Historical Commission. A better understanding not only of the history of the Abenaki people but their place in the here and now — is just one of the many reasons why living history events like the one the Northfield Historical Commission is sponsoring this weekend are so important, Graveline said. Read the full article in the Brattleboro Reformer. Two previous posts on Sokoki Sojourn reference Greenfield Recorder articles about the same event (here and here). Unfortunately, this well-written article ran a week too late. The Northfield event had already been held the previous weekend, on June 11, 2017.